Bangkok Lawyers has been providing legal services in Thailand for more than 15 years. It is one of the most known firms which provides quality but cost effective services to its clienteles. For legal consultation and assistance, please use the form below to contact us. Our law offices are strategically located. 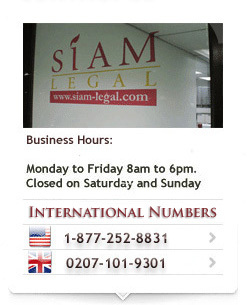 Siam Legal (Thailand) Co, Ltd.